Friday, August 13, 2010 \AM\.\Fri\. Jefferson Davis was always a friend to Catholics. In his youth as a boy he studied at the Saint Thomas School at the Saint Rose Dominican Priory in Washington County Kentucky. While there Davis, the only Protestant student, expressed a desire to convert. One of the priests there advised the boy to wait until he was older and then decide. 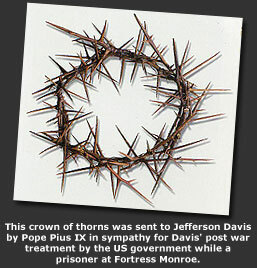 Davis never converted, but his early exposure to Catholicism left him with a life long respect for the Faith. When the aptly named anti-Catholic movement the Know-Nothings arose in the 1840s and 1850s, Davis fought against it, as did his great future adversary Abraham Lincoln. Edward Coles, the second governor of Illinois, is largely forgotten today, which is a pity. His actions in 1824 helped lead to Union victory in the Civil War. Illinois came into the Union as a free state in 1818. However, a majority of settlers in Illinois initially came from the South and some of them brought slaves, illegally, into the Sucker State. In 1822 Edward Coles, a 36 year old native of Virginia who had settled in Illinois in 1818, was elected Governor. Coles came from a slave-holding family, but he had long been convinced that slavery was morally wrong. When he arrived in Illinois he freed his ten slaves and deeded to each head of a family 160 acres of land to help give them a new start in a free state. He ran for governor because he was alarmed with the growing strength of pro-slavery forces in his new home state. In a tight four way race he won. As Governor, Coles fought against laws in Illinois that discriminated against blacks and against indenture laws that attempted to establish black slavery in Illinois under another name. In 1823 pro-slavery forces had a call for a constitutional convention put on the ballot in 1824. Had a convention been called, there is little doubt that Illinois would have been transformed into a slave state. Working feverishly, Coles and his allies narrowly defeated the call for a constitutional convention at the ballot box in 1824 and Illinois remained a free state. Had the Civil War begun with an Illinois that had been part of the Confederacy, or, more likely, split in two as Missouri was throughout the war between rival Union and Confederate camps, it is hard for me to see a Union victory. Illinois contributed a quarter of a million men to the Union cause, and without those men the war in the West could never have been won. Monday, June 28, 2010 \PM\.\Mon\. In the case of McDonald v. the City of Chicago, the Supreme Court of the United States ruled that the Second Amendment applies to the states. Read the decision here. The decision was 5-4 which is absolutely stunning since I think that there was no intellectually respectable argument to be made that the Second Amendment does not apply to the states. The bill of rights applies to the States due to the Fourteenth Amendment. In the opinions written by the majority justices, emphasis is given to the importance that the drafters of the Amendment placed upon the rights of freed slaves after the Civil War to keep and bear arms for their defense. A good day for the Constitution at the Supreme Court.